Night latches are commonly referred to as Yale locks. If you have lost your keys or it is only the cylinder which is damaged we will only change the cylinder, which is cheaper than replacing the entire lock. If the lock body is broken or damaged we will attempt to repair it, if this is impossible we will replace the entire lock. 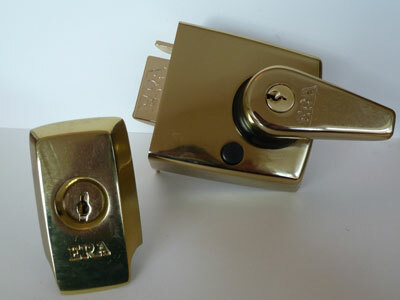 We can fit night latches to new doors, or upgrade your existing lock to BS3621 one. At the very least the lock should automatically deadlock so that the latch can not be 'slipped' - as seen being done in all the films with a credit card etc. As locksmiths we would recommend that all night latches meet BS3621 standards, as recommended by the police and insurance companies. Mortice locks come in various types, including rim mounted ones for thin doors. 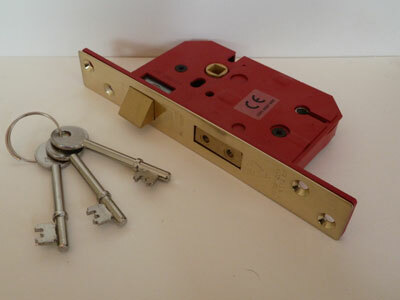 Insurance companies usually insist on a five lever mortice lock which meets BS 3621 standards. As locksmiths we would always advise to have a BS approved five lever mortice deadlock or sashlock fitted. Many houses still have 2 or 3 lever locks fitted to external doors. These can be replaced at a reasonable cost and the security of your home will be greatly improved. Mortice locks can also be operated by a cylinder, in which case we recommend a snap safe or anti snap and anti bump lock cylinder. We also supply and fit door chains, door restrictors, door viewers, numerals, knockers, and letter boxes. Doctor Lock Locksmiths supply and install locks for wooden, UPVC, and metal windows throughout Wakefield. As locksmiths we would recommended that key operated locks are fitted to all windows, this is also the advice from the police and insurance companies. If you cannot open your UPVC window then we can open it and repair the lock without damaging your window, this is much cheaper than replacing the window. If the handles, or hinges on your windows are damaged or difficult to operate we can replace them and make your window's operation as smooth as when they were new. We can repair all types of windows including aluminium and timber windows and windows fitted with tilt before turn (also known as tilt and turn) mechanisms. Do you know where all the keys to your house or business premises are? More than half the homes in the UK have keys with people other than the owners or residents. This is especially true in the case of rental properties. Did you know that the chances of being burgled within the first year of living in your new home are twice as high as the national average? As locksmiths we recommend having all locks on entry doors changed. Also, if you have moved home and have not changed the locks, some insurance companies will not pay out if you are burgled.Why not take advantage of our lock replacement service. We will replace all the external locks on your property and at the same time we can upgrade them to the relevant British Standard for the type of door. You could take this opportunity to have all locks of the same type work from one key. At the same time we can also carry out a security survey on the rest of the property, this is free, and make any recommendations which we feel will improve your security . We cover all of Wakefield and surrounding areas, so if you need any of the above services in Wakefield then give us a call. We also provide locksmiths in Leeds services.